Watering Station for the practical and space-saving stowage of hoses and garden accessories. 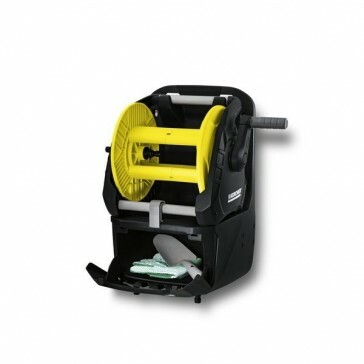 With removable drum, storage possibility for nozzles, spray guns, and spray lances and spacious storage box. Fully equipped. Compact Watering Station! The ready-to-use Premium Hose Reel HR 7.315 Kit 5/8" for mobile or stationary usage serves perfectly to water smaller and mid-sized areas and gardens. Thanks to its various stowage possibilities everything is in one place - finally. The features: removable drum (2 in 1), accessory holders to orderly store spray guns and nozzles, accessory box to store other garden tools like e.g. shares, shovels, garden gloves, etc. Including wall bracket, 15 m 5/8" Primoflex® hose, Nozzle Plus (2.645-177), 3 x hose connector, 1 x hose connector with Aqua Stop, G3/4 tap adapter, and G1/2 reducer plus additional clamp for spray lances. Fully assembled. Watering with Kärcher is the smart way to water!